The results of a 'wind in – energy out' validation test of the predictive methodologies employed in (1). Airtricity, a leading international wind farm developer, owns the Culliagh Wind Farm and thanks are to be extended to Airtricity for allowing their proprietary data to be used for this example case. A photograph of the wind farm is presented in Figure C.1. The case study presented here is relatively old and therefore some analytical techniques and assumptions used are no longer 'state of the art'. Nevertheless, as this is a real wind farm, it is considered that the inclusion of this case study remains valuable. The location of the site is shown in Figure C.2. The site lies in central County Donegal approximately 14 km southwest of Letterkenny. The location of Malin Head Meteorological Station is also marked on the figure. 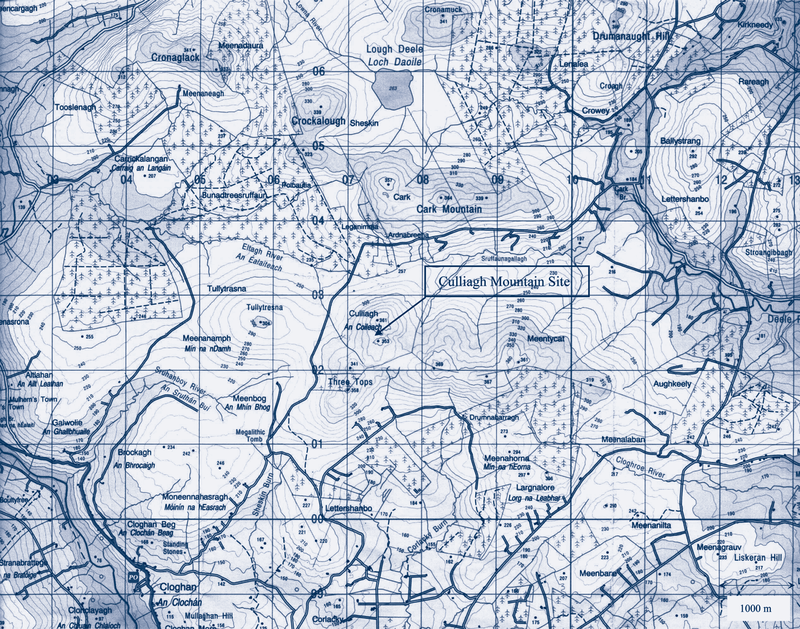 The wind farm site lies on Culliagh Mountain with maximum elevation of approximately 360 m, as shown in Figure C.3. The site at Culliagh Mountain has had one 30 m and two 10 m temporary meteorological masts installed since mid-1997. The 10 m data is not considered further in this report. The wind data from the 30 m site mast have been recorded using NRG sensors with a maximum of 40 anemometer and wind vane at 10 m and 30 m. An NRG 9210 logger was programmed to record hourly mean wind speed, wind speed standard deviation, 3-second gust and direction. The assessment of the wind climate at the site uses data recorded at a nearby meteorological station, Malin Head, which is situated on the coast approximately 65 km north-northeast of the Culliagh site. 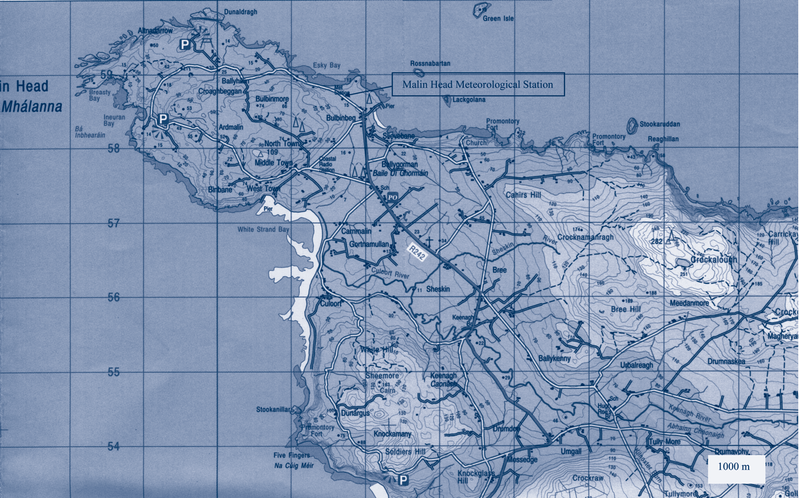 From discussions with Met Éireann (the Irish meteorological service) staff and consideration of other meteorological stations in the region, it was concluded that Malin Head was the most appropriate reference meteorological station for this analysis. Data from 1979 to 2000 have been used in the analysis reported here. Discussions with Met Éireann staff indicate that there has been no change during this period which will have a significant effect on the consistency of the measurements. This is important since the analysis method used here relies on long-term consistency of the measurements at the meteorological station. 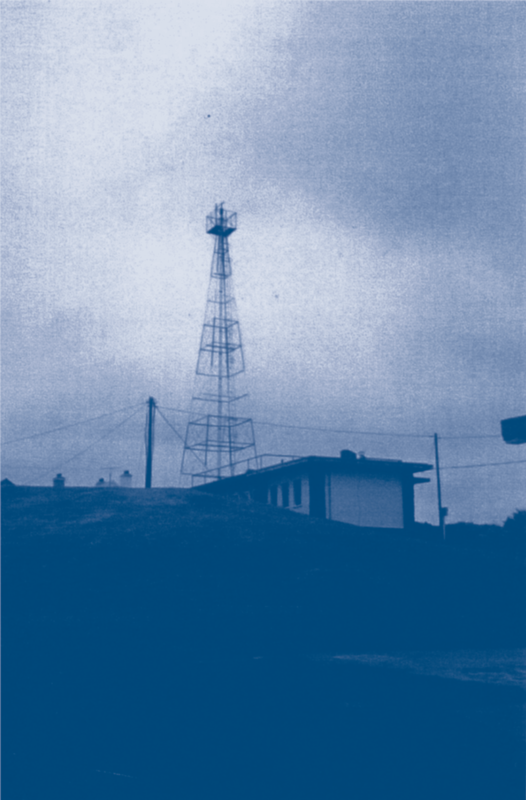 The location of the Malin Head Meteorological Station is presented in Figure C.4 and a photograph of the meteorological mast is presented in Figure C.5. The data sets from Malin Head and the Culliagh site, as used in the analyses described in the following sections, are summarised in Table C.1. 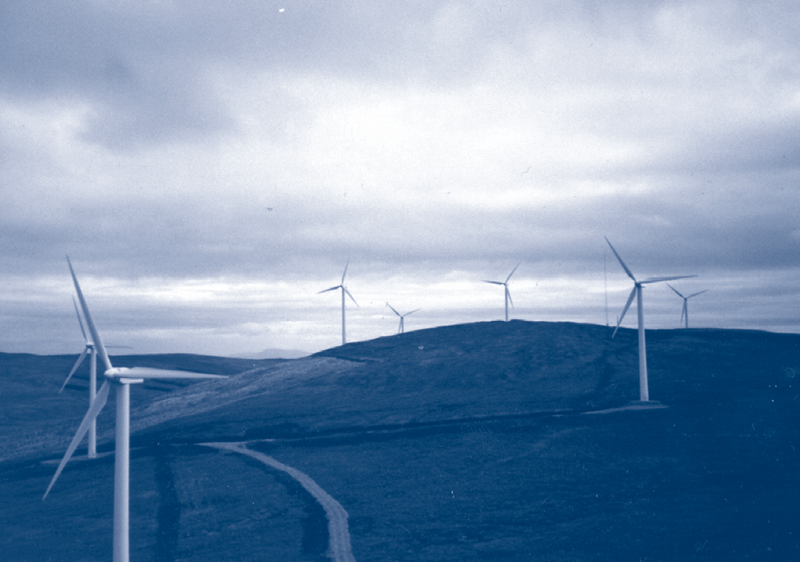 The wind turbine model selected for the proposed Culliagh Mountain Wind Farm is the Vestas V47 660 kW model with a hub height of 45 m. The basic parameters of the turbine are presented in Table C.2. The power curve used in the analysis has been supplied for an air density of 1.225kg/m3 and is presented in Table C.3. From data recorded at local meteorological stations and with standard lapse rate assumptions, the Culliagh Mountain site is predicted to have an air density of 1.205kg/m3. Since the predicted mean air density at the site differs from the air density for which the power curves were supplied, a small air density adjustment following IEC 61400-12:1998 was made to the power curves used in the analysis. The power curve for the Vestas V47 660 kW turbine has been compared to a reference curve from an independent test of the performance of the turbine. It was found that the reference curve outperformed the supplied curve by 2 per cent for the wind regime at the Culliagh site. This result indicates that the supplied curve is broadly in line with the performance that may be expected. The proposed Culliagh Wind Farm is designed to have a total nameplate capacity of just under 12 MW. The wind farm layout has been supplied by the client and the layout is presented in Figure C.6. Also shown in Figure C.6 are the locations of the meteorological masts. The Culliagh Mountain Wind Farm is located approximately 1.5 km south of the existing Cark Wind Farm. The effect of these turbines on the predicted energy production of the Culliagh development was also estimated. 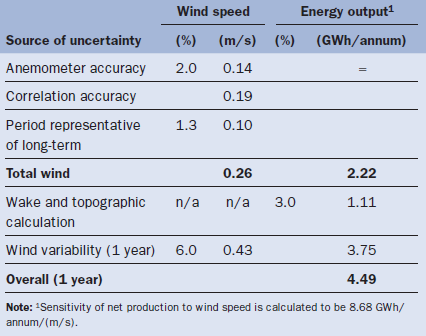 Sources of uncertainty in the wind speed and energy production estimates were identified and quantified. The measured wind direction at Culliagh Mast 05 at 30 m is compared to the concurrent wind direction measured at Malin Head in Figure C.7. The directions recorded between the two locations show some scatter but are generally well correlated for the most frequent sectors. 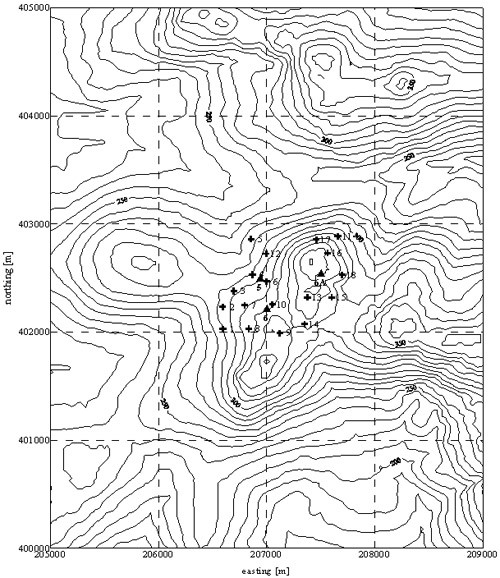 The monitored wind speeds at 30 m height in each of twelve 30-degree direction sectors are compared to the concurrent wind speed at Malin Head in Figure C.8. 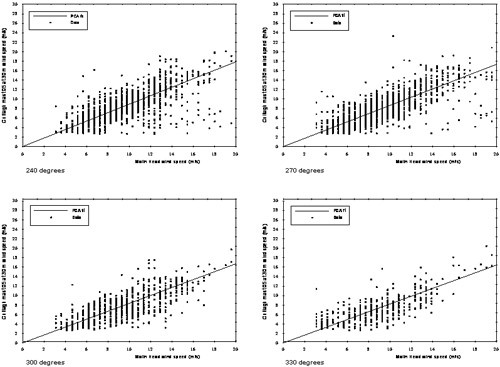 The quality of the correlation is considered to be reasonable for all direction sectors. 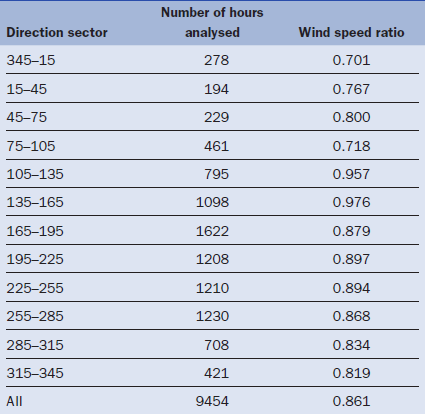 The wind speed ratios for each direction sector are presented in Table C.4. 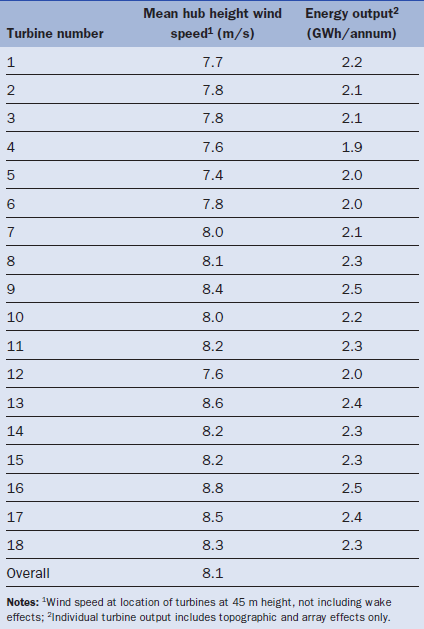 The wind speed ratios listed in Table C.4 were used to factor the long-term wind speeds at Malin Head for the period 1979 to 1998. By this method, the long-term mean wind speed at Culliagh Mast 05 at 30 m was calculated to be 7.2 m/s. 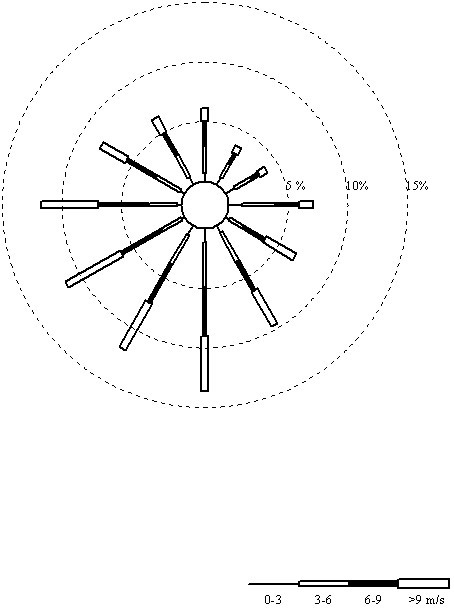 The corresponding joint wind speed and direction frequency distribution for Culliagh Mast 05 over the historical period 1979 to 1998 is presented in Figure C.9 in the form of a wind rose. The variation in wind speed over the Culliagh Mountain site has been predicted using the WAsP computational flow model, details of which are given in the appendix to the study. WAsP was used to model the wind flow over the site, being initiated from the long-term wind speed and direction frequency distribution derived for Mast 05 at 30 m.
Table C.5 shows the predicted long-term mean wind speed at each wind turbine location at hub height. The average long-term mean wind speed at a hub height of 45 m for the whole wind farm was found to be 8.1 m/s. The energy production for each of the wind farm layouts is detailed in Table C.6 (the energy capture of individual turbines is given in Table C.5). The energy production predictions include calculation of the array and topographic effects, an estimate of availability and electrical loss and factors to account for wind turbine icing, high wind hysteresis and the wake effect of existing turbines. Other potential sources of energy loss are also listed. It is recommended to carefully reconsider these issues, since at the time of this energy assessment there was insufficient information to estimate the effect on the predicted energy production. The monthly energy production of the wind farm is presented in Table C.7. 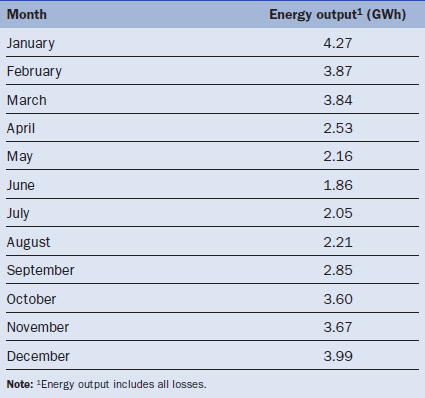 There is a large seasonal variation of the predicted long-term monthly energy production, with winter and summer months producing approximately 140 per cent and 60 per cent, respectively, of the long-term mean monthly energy production. The main sources of deviation from the central estimate have been quantified and are shown in Tables C.8a and C.8b, which consider future periods of ten years and one year, respectively. 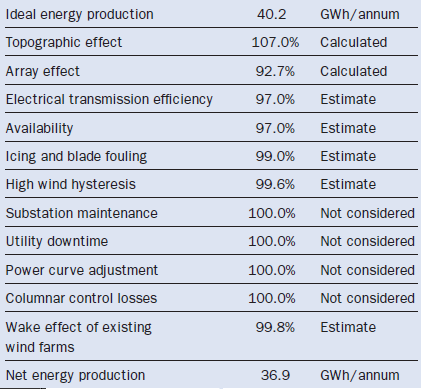 The figures in these tables, when added as independent errors, give the following uncertainties in net energy production: 4.5 GWh/annum for a future one-year period and 2.7 GWh/annum for a future ten-year period. The detailed derivation of the above uncertainties is presented below. There is an uncertainty associated with the measurement accuracy of the site anemometers. The instruments used on this site have not been individually calibrated to MEASNET standards and a consensus calibration has been applied. Batch calibration of NRG Maximum 40 anemometers have shown them to conform to the consensus calibration to within 1.5 per cent. Therefore a figure of 2 per cent is assumed here so as to account for other second-order effects such as over-speeding, degradation, air density variations and sensor mounting. No allowance has been made for uncertainty in the Malin Head anemometer, as consistency and not absolute accuracy is important. An error analysis was carried out on the correlation for each direction sector and from this the standard error for the long-term mean wind speed was determined. 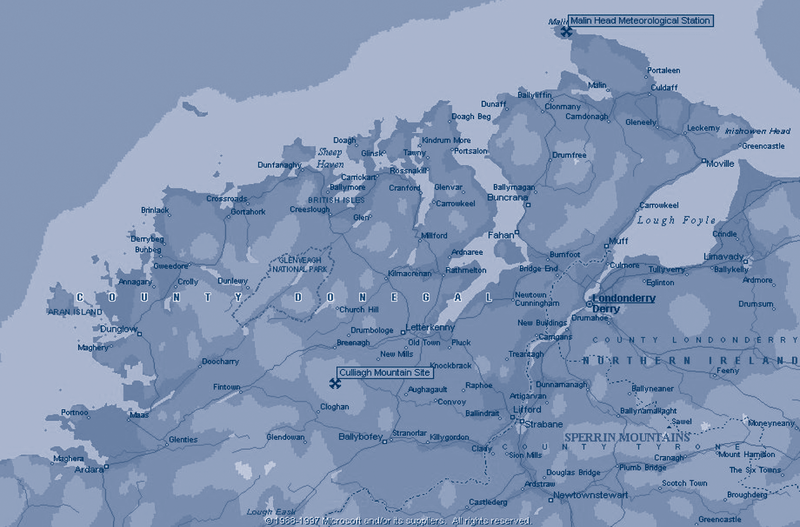 This was carried out for the correlation between Malin Head and Culliagh Mountain. There is an uncertainty associated with the assumption made here that the historical period at the meteorological site is representative of the climate over longer periods. 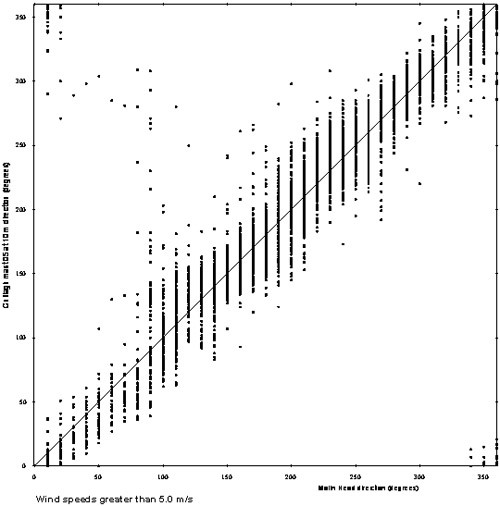 A study of historical wind records from a number of reference stations indicates an average variability of 6 per cent in the annual mean wind speed. This figure is used to define the uncertainty in assuming the long-term mean wind speed is defined by a period 20 years in length. For a finite number of future years, the mean wind speed may differ from the long-term mean due to the natural variability of a random process. Account is taken of the future variability of wind speed in the energy confidence analysis but not the wind speed confidence analysis. It is assumed that the time series of wind speed is random with no systematic trends. Care was taken to ensure that consistency of the Malin Head measurement system and exposure has been maintained over the historical period and no allowance is made for uncertainties arising due to changes in either. Uncertainties type (1), (2) and (3) above are added as independent errors on a root-sum-square basis to give the total uncertainty in the site wind speed prediction for the historical period considered. 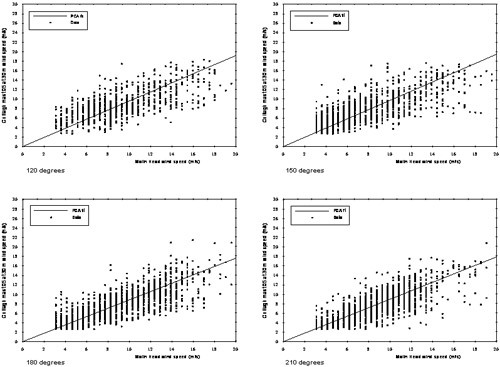 Long-term mean wind speed-dependent uncertainty is derived from the total wind speed uncertainty (types (1), (2), (3) and (4) above), using a factor for the sensitivity of the annual energy output to changes in annual mean wind speed. This sensitivity is derived by a perturbation analysis about the central estimate. Wake and topographic modelling uncertainties. Validation tests of the methods used here, based on full-scale wind farm measurements made at small wind farms, have shown that the methods are accurate to 2 per cent in most cases. For this development, an uncertainty in the wake and topographic modelling of 3 per cent is assumed. 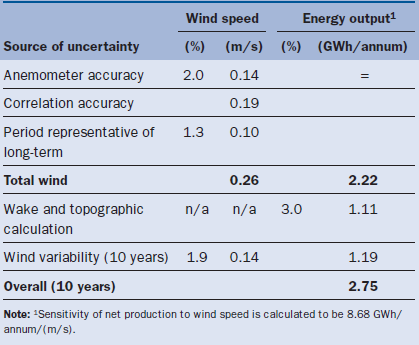 Future wind speed-dependent uncertainties described in (4) above have been derived using a factor for the sensitivity of the annual energy output to changes in annual mean wind speed. This sensitivity is derived by a perturbation analysis about the central estimate. Turbine uncertainties are generally the subject of contract between the developer and turbine supplier and we have therefore made no allowance for them in this work. Again those uncertainties which are considered are added as independent errors on a root-sum-square basis to give the total uncertainty in the projected energy output. The long-term mean wind speed is estimated to be 7.2 m/s at a height of 30 m above ground level. The standard error associated with the predicted long-term mean wind speed at 30 m is 0.26 m/s. If a normal distribution is assumed, the confidence limits for the prediction are as given in Table C.9. The long-term mean wind speed averaged over all turbine locations at 45 m is estimated to be 8.1 m/s. The projected net energy capture of the proposed Culliagh Mountain Wind Farm is predicted to be 36.9 GWh/annum. These predictions of net energy include topographic effects, array losses, availability, electrical transmission losses, air density adjustments, and factors to account for turbine icing, high wind hysteresis and the wake effect of existing turbines. The net energy predictions presented above represent the long-term mean, 50 per cent exceedence levels, for the annual energy production of the wind farm. These values are the best estimate of the long-term mean value to be expected from the project. There is therefore a 50 per cent chance that, even when taken over very long periods, the mean energy production will be less than the value given in Table C.8. 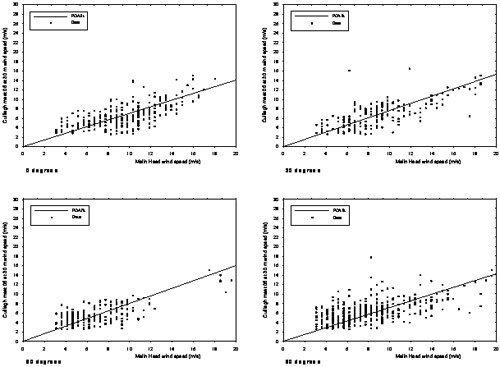 Estimates of long-term mean values with different levels of exceedence are set out in Table C.9. The standard error associated with the prediction of energy capture has been calculated and the confidence limits for the prediction are given in Table C.10. The Commissioning of the Culliagh wind farm took place in late 2000, and by November 2000 the wind farm was in full commercial operation. A review of the performance of the wind farm was undertaken in early 2002. 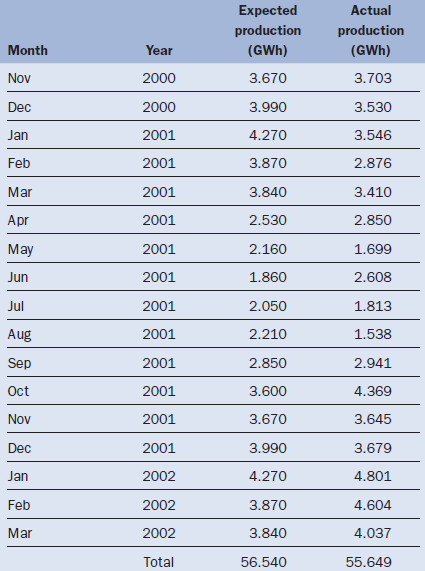 Table C.11 presents the expected long-term monthly energy production of the wind farm along with the actual energy production of the wind farm over the period from November 2000 to March 2002. It can be seen that individual months can deviate substantially from long-term expectations, for example February 2001 experienced production which was only 74 per cent of the long term expectations for this month, while in June 2001, 140 per cent of the long-term expectations for energy production in this month was produced. Over the 17 month period for which data are available, the actual production of the wind farm has been 1.6 per cent below long-term expectations. This figure is well within the 75 and 90 per cent exceedence levels for the prediction presented above. A detailed assessment of the availability of the wind farm over the above operational period has not been undertaken, but it is understood that high availability levels have been achieved. The data recorded at Malin Head indicate that the windiness of the period from November 2000 to March 2002 was some 4.9 per cent down on long-term expectations, making suitable assumptions about the seasonal variation of wind speed. 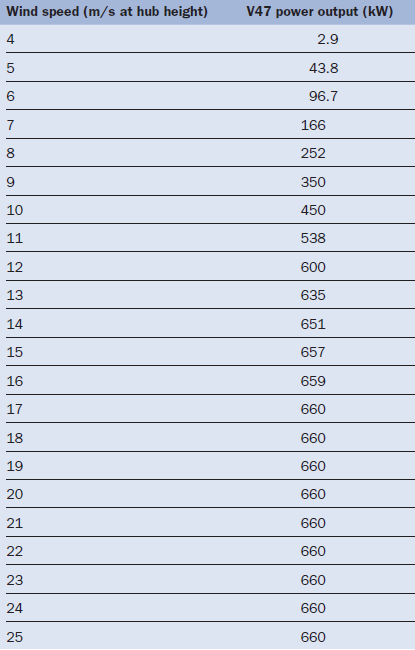 This implies that over the longer term it is likely that the energy production of the wind farm will in fact exceed the central estimate value of 36.9 GWh/annum and may settle at a level which is close to the 25 per cent exceedence level presented in Table C.10. A more detailed assessment which includes issues such as wind direction, air density and availability would be required to provide a revised central estimate of wind farm production. A separate validation of the accuracy of the modelling techniques employed to predict the long-term energy production of the Culliagh Mountain Wind Farm was undertaken. A comparison was made between the expected energy production of the wind farm, based on the actual mean wind speed recorded at Malin Head Meteorological Station, and the actual wind farm energy production. This was undertaken on an hourly basis. Thus the accuracy of the correlation relationships between Malin Head and the site and of the site flow model and turbine wake models was assessed using a ‘wind in–energy out’ test. Suitable adjustments were made to reflect the actual air density at the site. The comparison was undertaken for the operational period described above and data were only compared where all turbines were available and when wind farm SCADA data and data from Malin Head Meteorological Station were also available. Using these criteria, a comparison was made over a total of approximately 8300 hours. 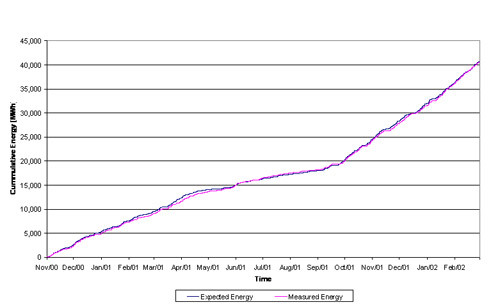 The results of the comparison of the expected and actual energy production of the wind farm are presented in Figure C.10 as a cumulative plot. Over the full period considered, the actual production was 99.7 per cent of the expected energy production of the wind farm, which provides confidence in the accuracy of the methods employed. It is noted that for individual months and for individual turbines larger discrepancies between the expected and actual energy production are observed. Appendix C has shown that the techniques outlined in the main text can be used to predict the behaviour of a wind farm with a good level of agreement. It has also demonstrated that the methods can be used to determine both mean values and associated uncertainties. It is hoped that it has proved a useful illustration of the techniques which are presently used by the industry.